Most of us save certain items with sentimental value, things that trigger special memories for us. For some of us (not naming names), everything has sentimental value, and the mementos can turn to clutter. How do we manage our mementos? What do we do with the things that hold sentimental value for us? This episode is inspired by a conversation with a TPW Mastermind group in which we discussed, “What do we do with all of the things that represent memories, but are taking up too much space in our home?” As you sort through boxes and clean closets, how do you decide what to keep and what to toss? What kinds of things do we save? Why do we save it? Sometimes we have a need to hang onto things with the concern that they won’t be there if we decide we need it someday. We may believe we are saving things for posterity, but without knowing if those things will have meaning to our children. What are the benefits of weeding through our belongings? The number one benefit of weeding through our belongings is that the items we keep have more meaning than having too many things we don’t appreciate. We also regain physical and psychological space by giving up the stuff we have been collecting for years. Perhaps by reducing the amount of stuff we save we can save the time and energy it takes to care for it all, and the money spent storing it. If we hold onto material possessions because they represent who we once were, we might be dwelling too much on the past, rather than looking ahead to the future and being present in our current lives. Sorting through our mementos, perhaps with a friend or family member, can bring about a catharsis by reliving the memories, as we handle the items one by one and then let them go. Step 1: Get your mind around why you keep it and why you want to keep it. Consider why you feel resistance to letting some of your belongings go. Do you associate a person with the item or do you perhaps fear that you will need it at some point? Maybe you are keeping someone else’s memories, like something that belongs to your grown children or from a friend’s wedding. Since those are their memories, you might consider giving those things to them. There is a difference between our memories and our mementos. Memories live in our minds, while mementos only serve as triggers that recall those memories. Remember, those items are not the people that you cherish; they’re things, and getting rid of them is not tossing the people. Discarding or giving away a memento is not discarding the memory or the person the memory is associated with. Step 2: Decide what to keep and what not to keep. There are no right or wrong answers. Do what feels right to you. Create a home, a mind, and a life that feels spacious, yet full of what matters most to you. Set up a station or find a big table where you can have space to sort through your things. Do a “big sort” into big categories, then go through the piles and evaluate what you want to keep and get rid of. Remember it’ll be emotionally draining, so give yourself the time to go through the process. Plan physical and emotional space to do your sorting. Have a friend help. The moral support might be comforting. And she can be a good sounding board. For example, if you can’t tell her who the people are in a photo, toss it. Be selective. You can decide ahead of time how much space you’ll devote to these mementos (one box, one or two frames, etc. ), and keep only what will fit into that space. Cull through and keep only the best versions of the most meaningful keepsakes. Don’t keep mementos that have bad memories attached to them. Life is too short to be weighed down by memories of a past boyfriend, a bad marriage, a crummy job, etc. Toss them. Step 3: Decide what to do with the things you’re not going to keep. You should discard blurry or duplicate photos. Also if you can’t remember why you kept it or in the case of a photo, you can’t remember who the people in the photo are, consider discarding or donating it. If you have boxes of items you are not going to keep, you can put them out at the next family event and let family members take what they would like. Step 4: Decide what to do with the things you are going to keep. Scan and put photos, greeting cards, and other paper mementos into digital format. Pick a couple of picture frames and photo books you like, keep physical copies of what fits in there, and toss the rest. Create a folder on your computer for the scanned photos, cards, etc., and rotate them as your desktop wallpaper, etc. Mac actually has a way for you to easily select a folder of photos as the source for your rotating wallpaper. Consider Shutterfly, or a similar service, to put your favorite digitized mementos into a book. You could create various books and give them to family members. Fracture (for digital photos) turns photos into displayable art by mounting them in glass. Turn them to art using Prisma, a free app for iOS. Use an app like Canva or PicMonkey to create digital collages or images that you can share on social media or use for your computer wallpaper. Consider shadowbox displays/art pieces of some of your favorites. Do you have a table or desk you could top with glass, under which you arrange a display of photos/cards/etc.? Check out Pinterest to see if there are ideas for creating something out of your cards. 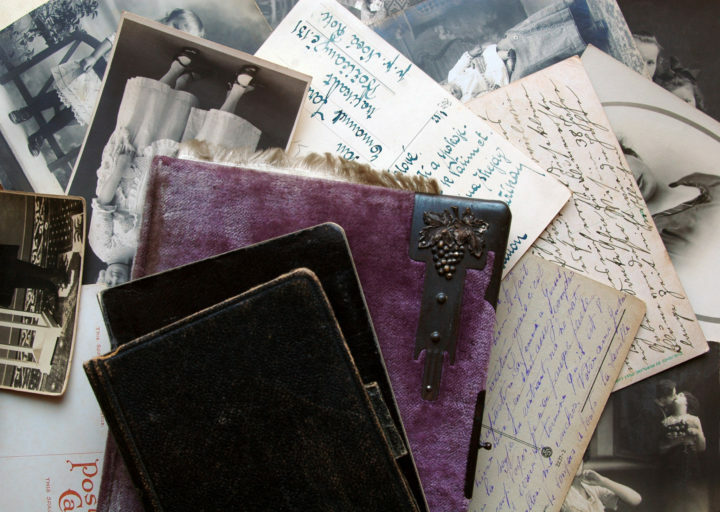 Consider writing a memoir based on what you find as you’re sorting and curating the materials. Use some of the best to illustrate it. Group the cards by theme/giver/etc., and use favorites from a particular theme to decoupage a box or a vase or something useful; give it a place of honor where you can see and enjoy it each time you use the box. Create a scrapbook/memory book for each child/significant family member using photos, cards, artwork, ribbons, mementoes relevant to him/her; annotate with a few sentences here and there of your memories; schedule a time to go through it with him/her one-on-one to relive the memories, tell her/him why you saved these items, then give her/him the book. Repurposing some cards for other people. Trim the front into a “postcard” you can send/give to someone else. Create a PowerPoint presentation of the cards or photos that you can share at a family event. For physical items you’re going to keep but not display, get a box of whatever size you choose–perhaps an archival box–and commit to keeping no more than what fits in the box. Pretend you are going to move once a year, so you will make decisions about what to keep/get rid of going forward. Which Mementos from my Childhood Should I Keep? I'm speaking as part of the upcoming Solopreneur Time Management Summit, which will be available online for free during September 7-16. If you’re interested in that, visit the event website for more information. If you haven’t already done so, please join me in the new The Productive Woman Community Facebook group, a private group where we can meet up and interact more—directly ask questions, share info, insights, and encouragement—basically talk about productivity. Find the group on Facebook (this link will take you there) and click the “join” button. I’d love to see you there. If you’re looking for encouragement, motivation, accountability in achieving your goals, and moving forward in a life that matters, consider joining an upcoming session of The Productive Woman Mastermind groups. Find more information and a link to the short online application on the Work with Me page of the site; email me if you have any questions.